I think they are BA-100 but not sure. Prices on auction houses are all over the page. Only have one set of Dura Ace pads and they are mounted as shown. Was thinking $50 plus shipping or am I high???? I would say $40-50 is about right if the finish is real nice on both sides. As for actual number and year there should be a parts number and date code stamped on the back side of the main arm usually the other side of the Dura-Ace or Shimano logo on most calibers. These look to be 78 blacks which were made 78-82. ​​​​​​So 0 YG. I found several sites with Shimano date coded and Y is 2000 and G is July. Even using the 0 as an O I get 1990. Am I reading this wrong?? The black anodized version was introduced for the 1975 model year and the Shimano revised their date code format for 1976, so these are definitely 1975 models. Price is about right for just the calipers. If you had the levers with good condition hoods, they'd be worth a lot more. How much more with the levers? 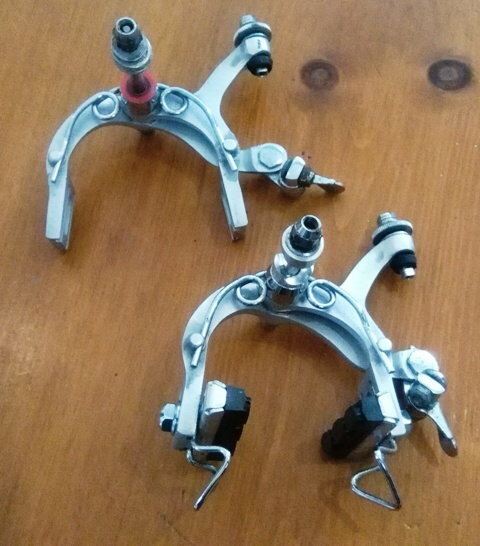 If you had a nice pair of matching levers with nice hoods $125 or so for the set no hoods figure $80-90 for the set. OEM hoods are what really escalates the price. 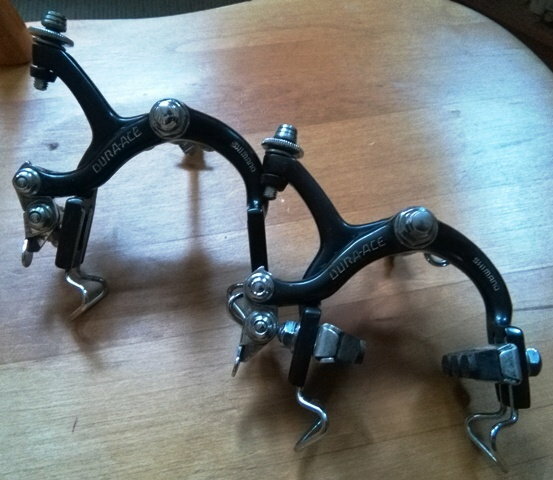 Caliper + levers are ~$75. However, with OEM good condition hoods, I'd agree with $125. What is the reach on these? Nice and a great project help for someone. Should have asked before but I assume the silver ones are the same for value? Checked on eBay but ones there looked a little bit rougher. The real nice silvers are worth a bit less about % 50-75 of the blacks sp $35-40 for the set.